Back in school in my switches and routers class, we were learning how to do simple Cisco router configuration using Hyperterminal and connecting into the console port using a serial cable. That is all very good to know, and very necessary. It is kind of like when you are in elementary school and you must first learn how to do math long hand before learning how to do it on the calculator. Or like how my Dad made me learn how to tie my shoe before I got to wear Velcro shoes. You get the idea. Well, before actually becoming a Systems administrator I thought that the only way to configure Cisco switches and routers was through the console, telnet or SSH. I though everything was done through the CLI interface. 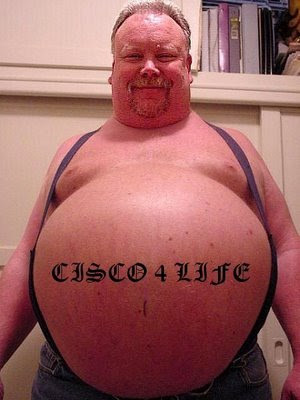 It turns out that Cisco, despite popular belief, is not a stranger to the GUI. In fact, most of their newer switches and routers have web based interfaces that allow you to configure most things. For more robust configurations, as well as seeing the big picture, such as all other switches in your network, Cisco has provided a free tool called Cisco Network Assistant. Sure tried and true, CCNA types like my coworker Zack frowns upon this, and prefers to "keep it real" by using the command line. That is fine too. For the rest of us Cisco novices, or people that prefer GUI over command line when available, The Cisco Network Assistant can be a life saver! Here is a screen shot of a simple setup for a remote office. Notice how it shows not only the switch you are connecting into, but also the neighboring switch. Have you ever used the Cisco Network Assistant? Do you prefer the Command Line Interface? If you have used both, which do you think is better? Hit me up in the comments.